BNBC-36 | This tool, unlike most cutters, features a triple-edged heavy-duty adjustable blade. Instead of just one blade that can wear out over a short period of time, just rotate the top and bottom blade to the next edge and you have brand new cutting edges. Each edge of the rotatable blade is made of specialized hardened alloy steel for a longer lasting and more durable life span. 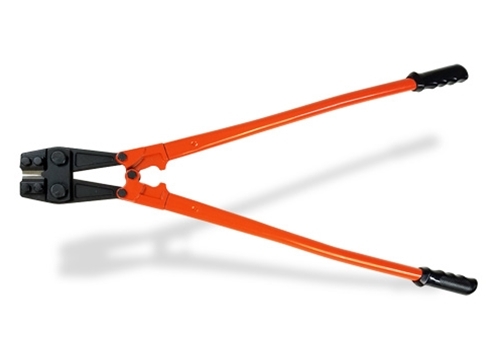 This bolt cutter also features handles and grips that are designed for better mechanical leverage and control. Available in 24", 30", and 36" lengths, all of which use the exact same replaceable tri-edge blade. How Durable Is The New Tri-Edge Bolt Cutter From BN? After being thoroughly tested this bolt cutter showed that after 1,000 cuts of 3/8" Grade 60 rebar, the blades had no signs of damage or wear.....they were still in perfect condition! And this was only using one of three available cutting edges! We also tested the bolt cutter on 1/2" Grade 60 rebar (about 25 cuts) and there was still no fracture or sign of any damage to the blade. Shipping Dimensions 25" x 7" x 2" 30" x 7.5" x 2" 36" x 7.5" x 2"